This project is constructed with surface-mount components and is small enough to be included in all types of models. It is about the size of a Lego block and that's why we have called it LEGO CHASER. 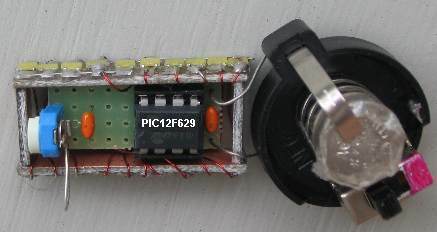 This circuit uses a PIC12F629 microcontroller chip. This 8-pin chip produces 7 different animations on a 10 LED display. The animations are selected by the position of a 100k pot and when the animation is showing, the pot can be adjusted to increase the speed of the animation. "Position 10" on the pot cycles through the 7 animations. A kit of components (matrix board for the chip plus a short strip of blank PC board for the LEDs), surface-mount resistors, capacitors, transistor, diode, switch, cells, battery holder, pot and 20 yellow LEDs with programmed PIC12F629 chip is available for $15.00 plus $5.00 postage. Click the link above and you will be sent an email with the costs. This is an ideal project you get you into surface-mount technology and you can add it to a model layout or build it into a Lego brick for a junior member. The project has two 10-LED displays. One on the front and one on the back. You can use only one display if required. ;Two displays of 10 LEDs in a "LEGO BLOCK"
movwf	temp	;is bit 6=0? movwf	temp		;is bit 6=1? movwf	temp		;is bit 6=0?